Can you help me understand how FAB 3000 handles composite (paint/scratch)? 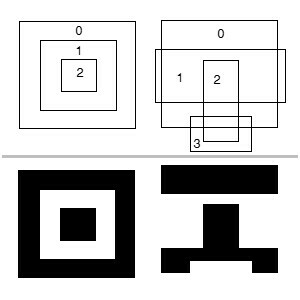 Layers that contain one or more objects with a defined "Composite Level" greater than zero are considered composite layers. Composite levels make it easy to define the fill rules for objects without the construction of complex polygons or geometries. Essentially objects are drawn per layer in the order of their composite level, starting with 0 and increasing to a maximum composite level of 1000. All "even" (and zero) composite levels are filled dark (ie. Paint), while "odd" composite levels are drawn clear (ie. Scratch). 2. Select menu: Edit | Properties. The Properties dialog box will appear. 3. Located Item "Composite Level", and change the value from the pull-down list. 4. Click Ok to exit the properties dialog. Note: If changes were made that are incorrect, you may Undo. Note: To "Automatically" change the composite level of a group of objects, based on their interior location relative to other objects, try using Polygon De-Embedding.